Mud Pie linen towels for the holiday season make great hostess gifts, girlfriend gifts and teacher's gifts this special time of year. 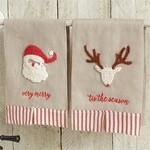 Fun and sparkly Christmas linen towels are in many colors and styles to choose from. 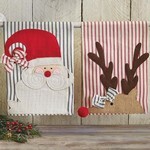 French cotton hand towels featuring Santa with bow on hat and Reindeer with red pom pom. 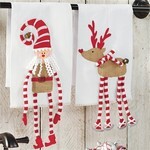 Christmas Linen Towels with Santa, snowman, and reindeer embellished and soft and washable are musts for my kitchen this year. Make a real statement in your home this holiday season with these gorgeous and all new linen towels. Christmas Linen Towels with the new sparkly angel and reindeers, the new Santa Legs linen towels, and always a favorite, Santa, snowman, and reindeer are here at Everything So Perfect, your specialty store for this special holiday season. Also shop our Burlap Christmas Stockings, Christmas Pajamas, Christmas Stockings, and Mud Pie Christmas gifts.